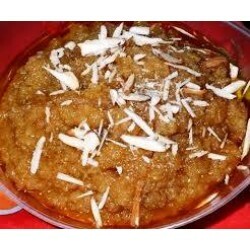 "Moong Dal halwa also India's most popular traditional desserts .That is adomed by everyone. This is fresh, hot and pure desi ghee used halwa.Deliver across jaipur within 2-3 hr.weight 500 grms. Minimum order should be 500 rs or above."